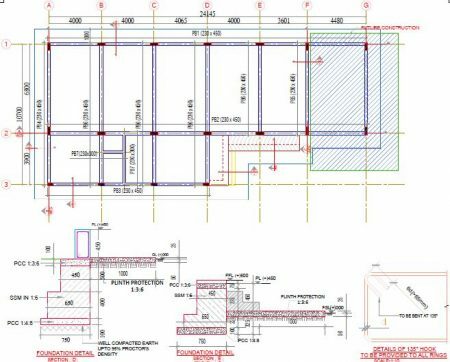 Different types of drawings is used in construction such as architectural drawings, structural, electrical, plumbing and finishing drawings. 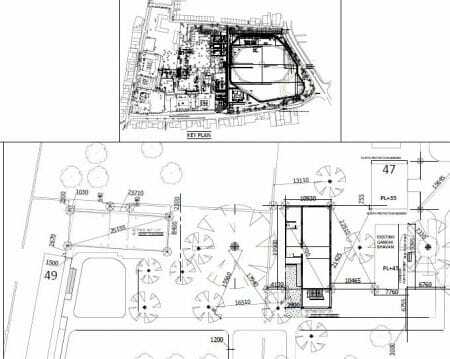 These drawings provides layout plans and details for construction of each and every part of the building. Drawings plays an important role in the construction field to convey the ideologies and perspective of the designer to the layman at site. The drawings may be used to indicate the overall appearance, inside or outside the structure, or they may be used to indicate precise measurements and other details for construction. Architectural drawing can be termed as the mother drawing for all the other drawings used for construction. It contains all the details of the project such as location site plan, setting out plan, elevations, sections and other details. This is primary drawing used for marking out the plan on the ground. It represents the location, orientation and information about the site’s topography, landscaping utilities ,and site work. 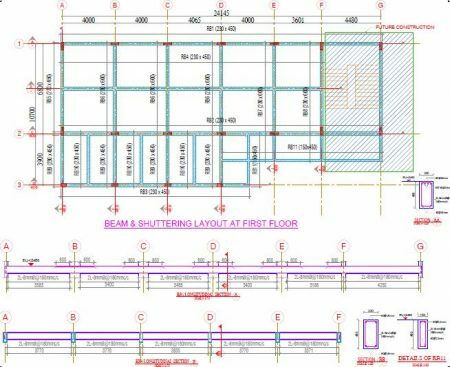 This drawing gives the information of horizontal dimensions of the building, thickness of walls, clear spaces inside the building and column locations. it also shows the openings required in the building such as doors, windows and ventilators. 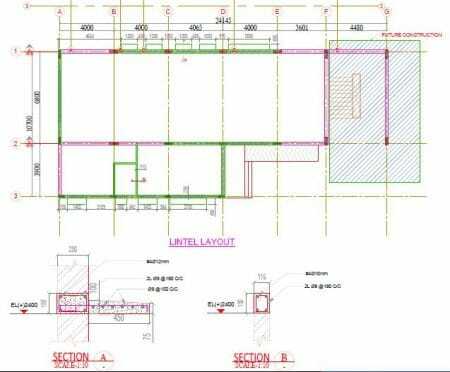 Section drawings represents the material of construction to be used, heights and measurement of the different components of buildings, type of structural components such as type of slab , etc. Its represents the drawing when the building is cut through a vertical plane. Elevation drawing represents the information of openings, size and shape of external surface, height of building and finish of the building after completion. These drawings are made by having a aesthetic view of the building. Structural drawings can be termed as the backbone drawing of the building. 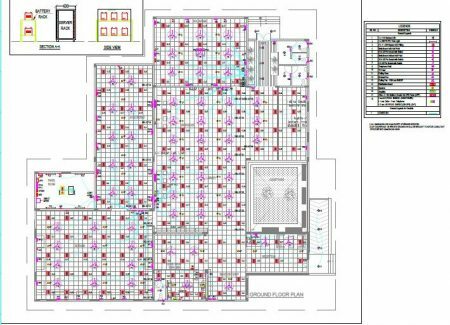 It consists all the information about the structural intervention that are coming on a building. It contains many type of drawing with very minute details and description. This is more of a codes and by laws of the buildings. 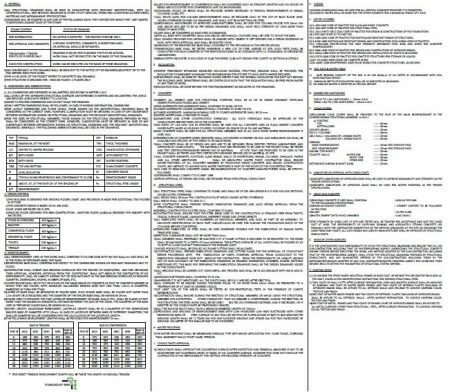 No drawing is found in this, but the details of all the structural drawings are mention in this such as concrete mix, lapping length, curing time, abbreviation, codes and other work procedures. 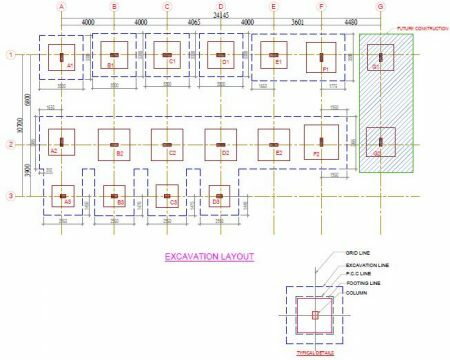 This drawing represents the footing excavation dimension, column position, footing plan and grid lines of column. 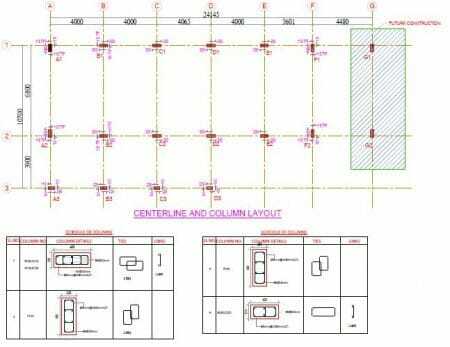 This drawing represents the position and orientation of columns and column reinforcement details. This drawing represents the dimensions, position and section of plinth beam and the details of reinforcement in plinth beam. 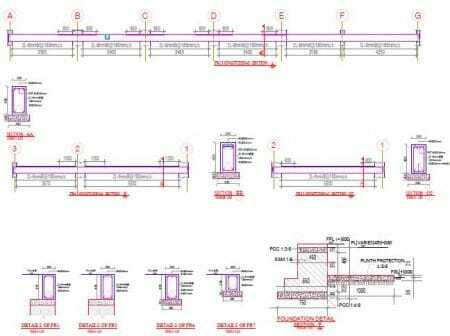 This drawing represents the dimensions, position and section of lintel beam and the details of reinforcement in lintel beam. This drawing represents the details of reinforcement of roof beam, its section and shuttering details. 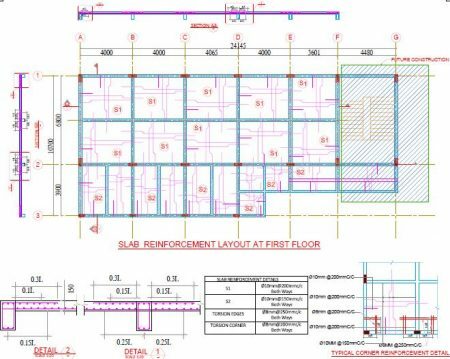 This drawing represents the details of reinforcement of roof slab, its section and openings in the roof for various purpose such as stairs or skylight. Electrical drawing represent the details of electrical fixtures, location of switches, fan, light and others. It also represents the load calculation, tapping for electricity, wiring path and other interventions such as AC and UPS and its components. 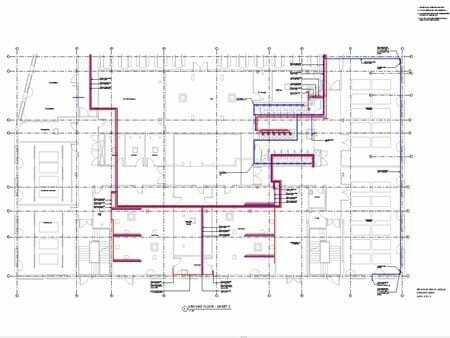 Plumbing drawings give the location of sanitary, piping for water supply system, fixture, and the process to connect every fixture. Finishing drawings represents the finish type of every component of the building such as flooring pattern, painting color, false ceiling shape, plastering texture and elevation design. These details are sometime given in elevation drawings also. There is no standard rule of drawings required for a project. Depending upon the type of building and requirement, types of drawings are made and issued .